June 25, 2018. New School Year has just commenced after Summer Vacation. We are proud to announce ABC’s 8th School Project. 17,000 Euro funding for a new English Primary School in the small village of Northern India (Gaya) where it is believed Buddha sat under a tree and obtained enlightenment. The school was inaugurated on December 19, 2017 with it’s inaugural class of 25 children in Pre-Kindergarten (4 year olds). The school will add a class of 25 children each year, up through grade 10. When the original 25 graduate, the school will be for 300 children. We are pleased to be partnered with Svatantra Trust. 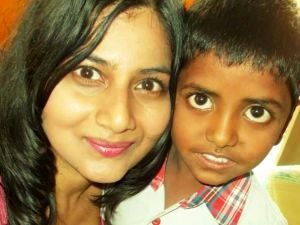 A reputable NGO, that has been running a similar school in rural Bangalore for underprivileged children for over 9 years now, impacting the lives of close to 400 children. 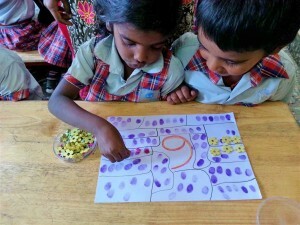 > 5 New ABC School Projects in three different countries (1 in Haiti, 1 in Nepal & 3 in India). With agreements to fund 96,000+ Euros in these projects, which will impact 1,360+ more children each year. August 9, 2017. 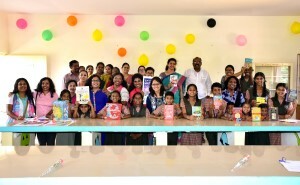 We’re proud to announce the inauguration of ABC’s 6th School Project: a new Library at the Nirmalaya Vidyalaya School! It will provide 1,000+ books and aid to instill a joy of reading for the 657 students living in the Gattahalli Area of Bangalore, India. This is a picture of our festive inauguration ceremony with students, teachers and NGO partners. On behalf of the students and ABC Ambassadors we like to send a Big Thanks to you, ABC Supporters, for making this project a reality! 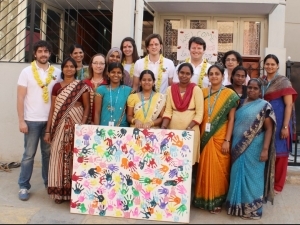 Also a special Thank You to our Partners in this project: ACTS Nirmala Vidyalaya, Bangalore, BEETF and MANTRA. 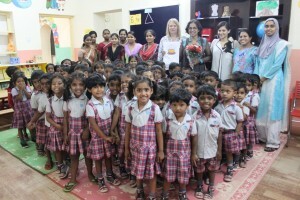 Celebrating another great academic year with 140 children enrolled at AlphaBet Club Building Blocks Edelweiss in India. Celebrating 46 Students Graduating to 1st Grade, plus 20 advancing to UKG Grade, plus 36 After School Program attendees, a great school staff, 110,000 times our students washed their hands at our school this year and surpassing 299,000 nutritious meals served at our schools these last 5 years. We also celebrated that 46 students (11 of our graduating students and 35 of our …past graduates) have been sponsored by private individuals to get next 10 years of their education sponsored. This being the last month of the school year 2015-16, teachers took lot of effort in reviewing all the subjects taught to the children over this year. Children also had the final assessments done by the curriculum heads at Gardenia School on April 12th. New parents for the next academic year 2016-17 had an orientation program on April 19th. We are also proud to mention that we will have a good increase in student strength to 61 children for 2016-17 academic year and for the first time since we opened this school in July 2015 we will have all three levels, K3, K4 and K5 in the next academic year! 46 students from K5 level graduated in April and are moving over to other neighborhood schools. A gala graduation ceremony was arranged in the GD Mara slum for our graduating children and their families. The program started with the lighting of the lamp by ABC Founder, Troy Swanson, Building Blocks Founder, James Ambat and ABC Project Manager, Meena Gupta and with a welcome dance performed by the After School Program children at Edelweiss. 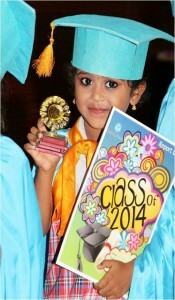 Kindergarten diplomas were handed over to all the 46 children. Special awards in various categories were also given out. Over 300+ people attended this ceremony and it turned out to be a great day of celebration for our graduating class and their families! Kids from the Gardenia School benefited in March with free Medical Check-ups, an initiative of The Alphabet Club to screen children from any illnesses. This project was done in partnership with several local non-profits and hospitals at Freesia School and it was successfully completed for all children. Furthermore, the students received multi vitamin supplements and parents were advised on all the findings from this medical camp. Holi, festival of colors was celebrated with children, parents and staff and everyone thoroughly enjoyed playing with colors on this day! Also, screening test for children seeking new admissions for the 2016-17 academic year has been successfully completed! K3 and K4 having done extremely well in the 1st assessment conducted in the month of February, Gardenia School is proud to mention its accomplishments in academics! 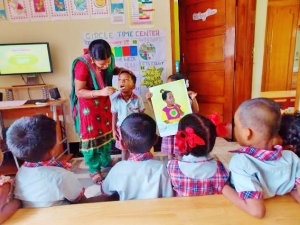 This is what the curriculum supervisors, Meher and Selvi had to say: Children are good in literary and math, they act confident and are able to work well independently. Also, they have excellent communication skills and their classrooms are well organized with all the required study materials. With 90% attendance and school in operation for 24 days, February month has progressed very well academically! Children are reviewing concepts learned in the beginning of the year and preparing them for assessments that are due in the month of March. K3 and K4 also had a second round of assessment in all the schools. Social workers are busy with house visits for new enrollment in K3 for the next academic year. Year 2015 has brought a great achievement for the AlphaBet Club! 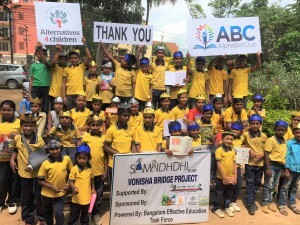 ABC takes pride in mentioning that the 3rd school launched in June 2015 in partnership with Building Blocks India is another successful project. There has been a constant increase in the enrollment since the opening of the school. We started out with 35 children at K3 and K4 level. Today we have 41 children attending Gardenia School which is a 17% increase in enrollment since the opening. With the support of the School Manager, Teachers and Social Workers, the goodwill and support in the community is constantly growing and we are looking forward for higher enrollment in the next academic year. 2015 started off with a bright spark and ended with the same joy and happiness at Edelweiss. December marks the end of the year and is the most joy-filled month for everyone as we move on and celebrate the achievements from this year and look forward to starting fresh in 2016. Edelweiss had a lot to celebrate when stepping into the second half of the academic year. Enrollment has been steady with very few drop outs, maximum number of children benefitting from this program. We also celebrated the reaching 250,000 served meals since the opening of the school. We are expecting all 46 children from K5 classroom to graduate in April 2016, wishing and hoping the best for these children in continuing their education in English Medium schools. As the new year is upon us, this is the time of the year to reflect on what we accomplished in 2015. We’re looking back at a great year for ABC and feel proud of what we have achieved with our ABC charity projects, the improvements in our organization and the 15 [FUN]draising events in Amsterdam, Madrid and Phoenix. Thanks to your support, we were able to make a lasting change in the lives of many children in need. Through Education we can offer them a better chance at the future they deserve. 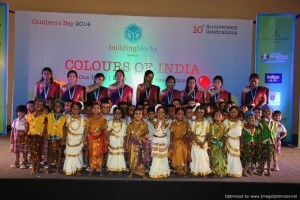 The 11th anniversary of Building Blocks was celebrated on Children’s Day, November 14th with a gala show put on by the students from the Building Blocks schools! Nice to see the children dance on popular Indian Cinema songs and entertain the crowd. 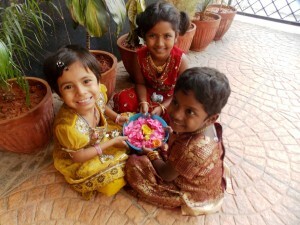 The theme for the Children’s Day was Colors of India. Both K5 and ASP students of Edelweiss School performed dances from the top billboard songs from this year. 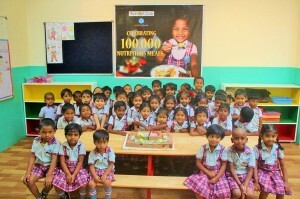 Like always, Leela Palace in Bangalore served 450 delicious meals to all the children, staff and guests for this occasion. 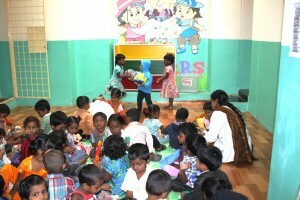 A total of 700 blankets were distributed to all the students of Building Blocks as gifts for Children’s Day. Teachers carry the responsibility of shaping students’ future – the leaders of tomorrow! With this in mind, our Teacher Training Program makes a constant effort to improve the skill levels of teachers. This month as well, the teachers of all Building Blocks Schools took part in workshops on Phase One Jolly Phonics Aspects. Each school was given a topic and had to present the topic in front of all the other teachers; Gardenia school gave a presentation on the topic of Environmental sounds. 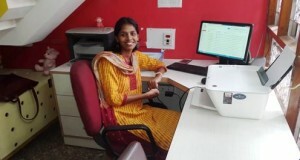 A brand new office space was created for Mary, the school manager at Edelweiss school. This space was a dead space in the school and not being effectively used for any school activities. This space worked out perfect for an office with some minor alterations. Now parents can reach out better to Mary, she has good visibility to the front of the building and can see who are dropping and picking up the kids. Education is the key to a successful development and teachers have a lasting impact in the lives of their students. On September 5th, Teachers Day was celebrated at Gardenia school. A day to express gratitude for the great work teachers do at the school all year long. Building blocks organized a memorable outing for them at the Garden Asia Resort on the 7th September. Children learned numbers orally from 1 to 50 and counting by 10’s/100’s. In Fun with Math class, they learned the key words big/small/thick/thin/rough/smooth/hard/soft/fast/slow etc. “On September 5th, Edelweiss celebrated Teachers Day to express gratitude for the wonderful work that teachers do all year long. Edelweiss takes great pride in their staff and students look up to their teachers as their role models. Parents of students participated in this celebration feeling thankful towards the good level of education their children receive here. On the 7th of September, Building Blocks organized a memorable day out for the teachers at the Garden Asia Resort as a sign of appreciation. Students were happy to take part in many Indian Independence Day programs that were arranged at Gardenia.. National flag was hoisted and Tri-color sweets and chocolates were distributed to them. With an average attendance at 86% and enrollment at 36 children Gardenia is slowly creating new records every month. Happy to also share that the Nutrition program kick started and children are now given breakfast and lunch free of cost to them. August 15th marks as the Independence Day for India and all our ABC schools celebrated 69th Indian Independence day by hoisting flag, singing national anthem, children dressing up as various historic characters and feasting on a special lunch. A lot of art activities were arranged to entertain the children. Parents too joined the children in this celebration. No more tantrums to throw, no more crying to say good bye to their parents – Just one month into the school, what a change in the 3 and 4 year olds for being first time away from their parents! 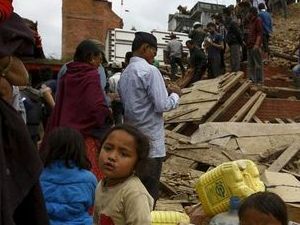 Emergencia Nepal, además de los proyectos de educación de ABC. Hambre”, una organización humanitaria internacional independiente que combate la desnutrición. to the ABC education projects. Each Child gets a Toy. Thanks to “Ñ” team (marketing company), AlphaBet Club Madrid signed an agreement with La Moraleja Green (Shopping Mall in the north of Madrid) to run a campaign during Christmas period to collect toys for our projects. 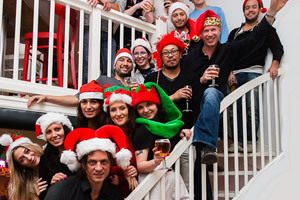 On top of that, we threw a Three Wise Men Party where requirement to join was to bring a toy. As a result, we managed to collect over three cubic meters of toys that ABC Madrid volunteers packed, classified and prepared for delivery by clearing all customs requirements. Toys were sent to two different projects. 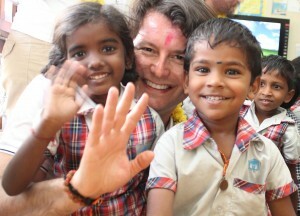 One was to when Giles and Diego took a part to our school and nutritional projects in Bangalore (India). The other waas through the NGO – ACOES delivered remaining toys among kids at Santa Teresa de Jesus school and several kindergartens in Tegucigalpa (Honduras). AlphaBet Club volunteers Ioana Boldea, Troy Swanson and Brian van Daal visited Edelweiss School and the GD Mara slum (this is where most of the students of Edelweiss School live). The welcome and hospitality at the school and in the slum was overwhelming with lots of tiny handshakes, hugs and ‘high fives’. To see the school and the environment where these children grow up makes it clear that the education- and nutrition projects at Edelweiss school are making a huge difference to change these children’s lives. A very memorable day! 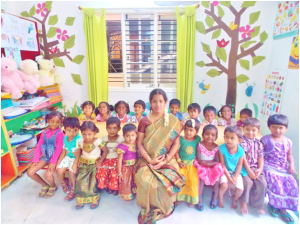 Today we celebrated the Opening of our New GARDENIA School for 40 to 60 three to five year old children living in the DJ Halli Slums in Bangalore. This is AlphaBet Club’s 5th School project…. a great milestone! We like to thank and compliment our partners DNF, Casa Foundation and Building Blocks for the great cooperation and an amazing job. Congratulations with a beautiful new school! On behalf of the children and their parents…. Thanks to all ABC donors, sponsors and friends! And Last but not least a big THANK YOU to all ABC Ambassadors/volunteers in Amsterdam, Madrid and Phoenix. Without your effort and support this would not be possible! What? Join us for a school launch CELEBRATION, where our new 3 to 4 year old students and our friends and partners will come together to have some fun, some food, a short ceremony – and then walk through the slum and meet other family members of our students. Who’s Invited? – You, and any friends/family of yours you think may enjoy attending. 20+ Children (aged 3 to 5), plus friends and partners. (We expect about 75 in attendance). 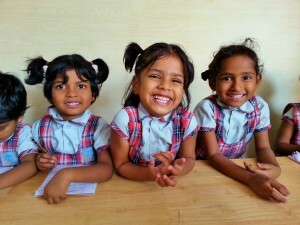 We’re proud to announce AlphaBet Club’s 5th School Project, our 3rd School in India. 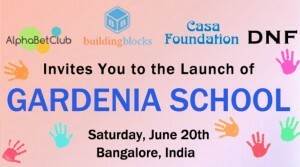 We’re excited after two years of working on this project, to be on June 20th opening another Building Blocks School for 40 to 60 three to five year old children living in one of the largest slums in Bangalore. School will be 6 days a week, with instruction primarily in English, with students receiving 2 nutritious meals a day, free of charge. With the opening of this school we aim to be the first step in empowering these children to break the cycle of poverty – through education and nutrition. Thanks ABC Volunteers, Partners, Donors & ABC Community for your continued support and the impact you’re having on many children’s lives. AlphaBet Club Building Blocks is proud to have completed another impactful academic year. 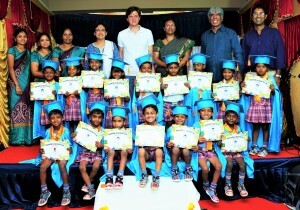 A total of 37 children graduated this year from K5 in Edelweiss. A total of 33,695 MEALS for the academic year, 135,322 MEALS since opening of Edelweiss and 211,970 Partnership MEALS were served! Kindergarten diploma certificates were handed to all the graduates. Academic excellence certificates were handed over to outstanding children for many categories. 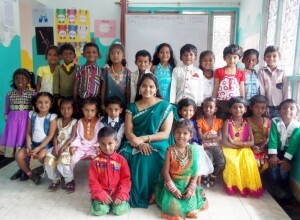 Celebrating another great academic year with 114 children enrolled at AlphaBet Club Building Blocks Edelweiss in India. Celebrating 37 Students Graduating to 1st Grade, plus 51 advancing to UKG Grade, plus 26 After School Program graduates, a great school staff, 110,000+ times our students washed their hands at our school this year and surpassing 200,000+ nutritious meals served at our schools. We also celebrated that 39 students (20 of our graduating students and 19 of our …past graduates) have been sponsored by private individuals to get next 10 years of their education sponsored. Month of March has been an exciting month at Edelweiss. AlphaBet Club Building Blocks is proud to have surpassed 200,000 meals this month! 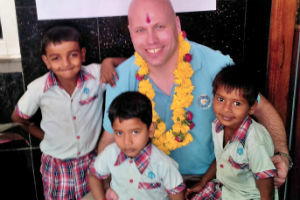 With Troy Swanson visiting ABC Edelweiss and with many of ABC volunteers and friends visiting, this month has been a busy month for all at school. Learning came to an end with an official final assessment for all K5 kids in all the Building Blocks Schools. 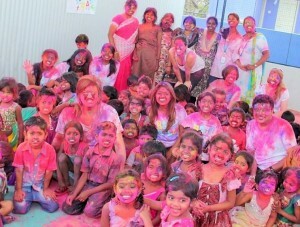 Edelweiss also had a fabulous HOLI – “festival of colors” celebration with many friends. Holi – Festival of colors signifying the arrival of spring and its bounty of freshness with colours was celebrated with exuberance with friends and visitors at Edelweiss. 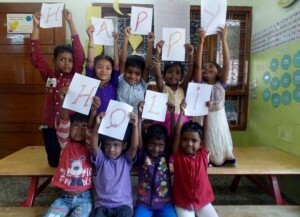 Children had a fun filled, colorful and a playful holi celebration. As we get close to the end of 2014-15 academic year, reading, writing and learning at our Edelweiss school is at a full swing. Children of K5 are being tested every Friday in English and Math. They seem to be doing very well like all students of other BB schools. Come April, it will be a sad but a proud moment for all the teachers to bid these children adieu as they move out of Edelweiss and start another remarkable journey in other English Medium schools. 2014 has passed and we at Edelweiss School have smoothly transitioned into 2015. 2014 saw great accomplishments! K5 children are almost ready to exit our schools. With only few months left in the current academic year, curriculum coordinators and teachers are working very hard to finish out yet another successful year for all our children at our ABC Schools. Children practiced writing numbers and writing missing numbers from 1-50. They were also tested orally for even and odd numbers. 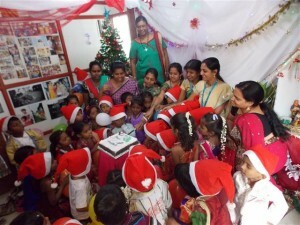 ABC Edelweiss children had wonderful Christmas celebrations! 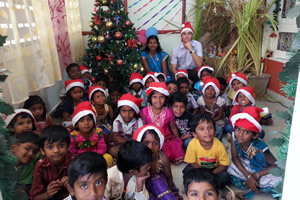 With Christmas in the air, our expert carol singers (Edelweiss children) and an onboard Santa Claus (Mary, Edelweiss teacher) to bring in gifts there was nothing left in mesmerizing these kids. They were spell bound by the month long happenings at school. 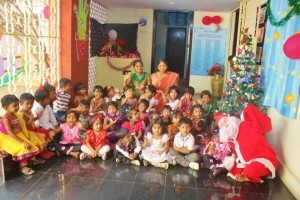 Children also enjoyed good ten days of holidays for Christmas and New Year. Year 2014 went by smoothly at Edelweiss with many scholastic goals achieved and learning reaching its summit as we go past the mid academic year now! As the new year is upon us, this is the time of the year to reflect on what we accomplished in 2014. For us that means looking back on the ABC charity projects in India, the improvements in our organization and the 12 [FUN]draising events in Amsterdam, Madrid and by our recently launched Phoenix chapter. A mega Children’s Day event and the Tenth Anniversary of Building Blocks Schools was celebrated on Nov 15th at Primus Public School with about 400 Building Blocks children and a total of 600 people attending this event. This was a huge success with brilliant performances from BB kids which completely mesmerized the audience asking for more! Guests danced till their feet ached, clapped till their hands turned sore and sang their voices out with the children. This lifted the spirit of the kids and left them performing at their best. This one time yearly event drew a big crowd and the newspaper media to the event wanting to publish the article for Children’s Day! Visiting the Hindustan Aeronautical Museum (HAL) in Bangalore was a life changing experience for Edelweiss students as all experienced planes for the first time! 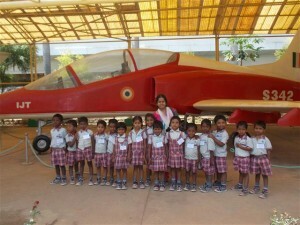 Children were thrilled to see full size planes and helicopters up close. Their imaginations have expanded by visiting this museum! Diwali the “Festival of lights” was celebrated in October with great pomp and honor and all the ABC-Edelweiss kids enjoyed feasting on the special lunch that was arranged on Diwali day. September has been an exciting month at ABC-Edelweiss. We have seen a lot of events, activities and a wide range of learning by children at our Edelweiss School. Join us as we share these moments with our ABC members! Volunteers from Blue Jeans Co. have given our school a face lift by painting the school. Sandra from Action Care Dubai visited our center. Teacher’s day was celebrated on 5th September with all the students and teachers. Also, September born children celebrated their birthdays with their friends at school. August has had many extraordinary events at our ABC sponsored Edelweiss school and we are eager to share the news with all ABC members. August 15th, 68th year of Independence is a memorable day in the history of India. 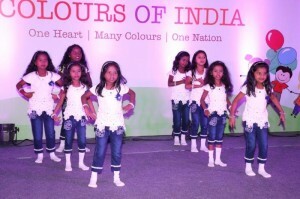 ABC Edelweiss and Freesia Schools had the opportunity to celebrate the Independence Day in great glamour. Children also have had a fun filled field trip to Pizza Hut. For many, it was the first time having Pizzas in their lives! 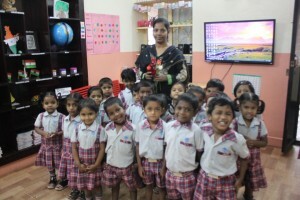 Our K4/K5 children are progressing well in academics and ASP children getting benefitted with our After School Program. A lot has happened in July! 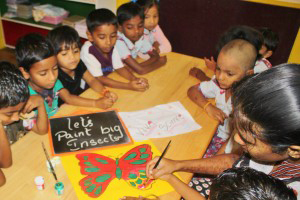 Here is a peek into the activities that the children of Building Blocks Edelweiss School ventured into. With our regular stream of activities that we do in Math, Social Science, Value Education, Health and Hygiene, this month’s prime focus was K5 children’s visit to the planetarium. Children were able to connect their classroom exploration of solar system and universe to the models on display and the film on constellations. June 2014-15 marks the beginning of the new academic year for ABC Schools. With notable rejuvenation from our K5 children, hustle and bustle of the first timers (K4) and with lot of anticipation and expectation from teachers for the new academic year, the school started off promptly. With great many planned activities, lots of action and with a renewed vision, there is a lot to look forward to this academic year! March has been a very exciting month for the Edelweiss School. Not only has the school been visited by special friends but a new play area has been added for the kids. AlphaBet Club volunteers – Giles, Diego, Yana and Laura along with Troy visited the school and were overwhelmed at the students’ performances and the organized structure of the school. 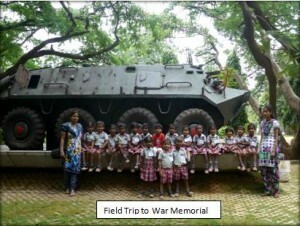 They were thrilled to see the maintenance of the school environment compared to the slums the children came from. February has been a fun packed month of learning at Edelweiss. We have had some exciting training sessions, refreshing the vision of the teachers and staff to continue their efforts to help make a difference in the lives of the children. We also have had a re-envisioning parent-teacher meeting to help inspire the parents to continue the journey of training and educating their children for the future and to instill in them the importance of education. February is the ninth month of the eleven month school year. 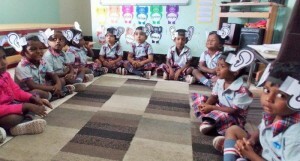 Students in Edelweiss are fast progressing in their academics as well in other aspects of their daily lives such as hygiene, safety, health and nutrition. Brian van Daal is lead volunteer with ABC for a long time already. He’s responsible for Fundraising Events in Amsterdam and Finance. 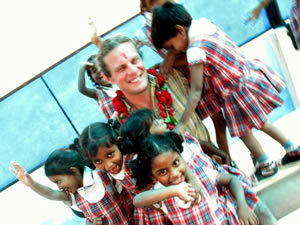 In 2012 Brian visited our school projects in Bangalore during his holiday. Enjoy reading his experience. The new year of 2014 started off well, with fresh vision and fresh inspiration, and never a dull moment! We have had some exciting training sessions, refreshing the vision of the teachers and staff to continue their efforts to help make a difference in the lives of the children. We also have had a re-envisioning parent-teacher meeting to help inspire the parents to continue the journey of training and educating their children for the future and to instill in them the importance of this, to bring them a new and bright future. 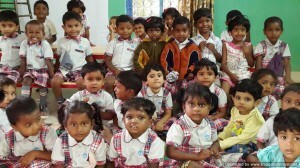 Although January is the first month of a brand new year, the children at Edelweiss School are starting the eighth month of their 11 month school year. Children are back after an enjoyable and well deserved winter vacation. December was a month full of many celebrations at Edelweiss – 100,000th meal celebrations, special visitors and Christmas celebration and gifts at the school. December is the seventh month of the 11 month school year. 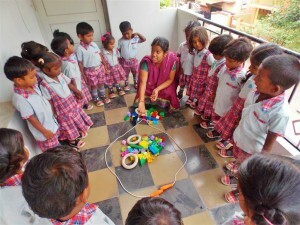 Children at Edelweiss enjoy coming to school and learning new things everyday in their Circle Time. 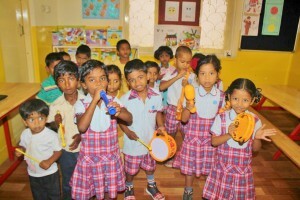 The teachers are also using new and interesting techniques to teach concepts to children. Relive the Children’s Day celebratory fun & gifts received by students of AlphaBet Club Edelweiss, Freesia and all Building Blocks Schools in Bangalore. Children’s Day is celebrated on the 14th of November in India and is the birthday of the first Prime Minister of independent India, as he was known for the deep affection he held for children and his belief that children and youth were the future of the country and education would help them achieve anything they dream of. 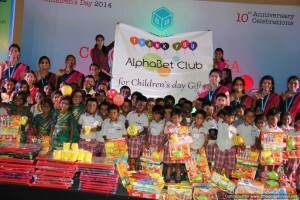 AlphaBet Club’s partner in India – Building Blocks, celebrated Children’s Day on Saturday, the 9th of November, combining it with another big occasion – the 9th year anniversary of the organization. Relive the celebration with our 238 students attending ABC Building Blocks Edelweiss & Freesia Schools as they celebrated at each school last Saturday with the teachers and a special day of activities. Students have a week off of school. Students at Edelweiss School received a Christmas present of a large warm blanket. This December is a colder than usual and we believed that the students and their families would get good use of the blankets. The 120 blankets were funded by a donation of AlphaBet Club FacePainting volunteers at a past event. Special thanks to Joska van Oosten, Liselotte Betist, Lotta Isopuro and Victoire Klaassen for donating the funds they raised at ABC Halloween party 2013 while facepainting, and donating them to go towards these Christmas gifts. As the holiday season is upon us, this is the time of the year to reflect on what we accomplished this past year. 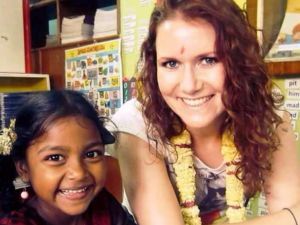 For us that means looking back on the ABC charity projects in India, the improvements in our organization and the 17 (FUN)draising events in Amsterdam and Madrid. 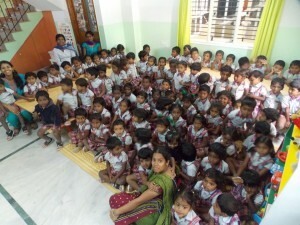 * Completed our 4th New School Project – Freesia, in Bangalore, India and already has 108 students attending. 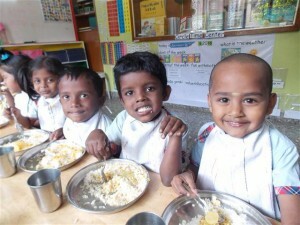 * Served 61,972 nutritious meals to students in our schools in India in 2013 – and surpassing 100,000 meals since openings. Celebrating ABC Edelweiss School’s 3rd Year Anniversary Today! We’re happy today, to celebrate the 3rd Anniversary of ABC’s Edelweiss School! Enjoy watching the Launch Video and TV 9 News Video (BELOW) from our opening day ceremonies in 2010. We’re pleased to share that our school now has 128 students that attend daily, up from 45 students when we launched 3 years ago. Children attend school 6 days a week, with instruction only in English, and approximately 30 children graduating each year. Each student receives 2 nutritious meals a day, free of charge as well as periodic medical check ups and gifts at Children’s Day. Edelweiss School has served at total of 80,000 nutritious meals to students since it’s opening 3 years ago. October is the fifth month of the 11 month school year. Children here at Edelweiss are having a fun time coming to school and learning new things everyday in their Circle Time. 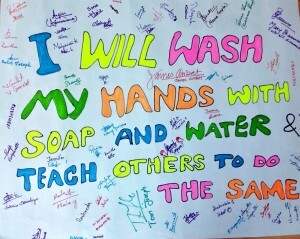 The kids are learning about basic hygiene in their classes. The K4 class learned about mannerisms, how to be well-mannered. In Viva Science, the children learned about Weather and the different seasons and also various outdoor activities. September is the fourth month of the 11 month school year. Children here at Edelweiss are having a fun time coming to school and learning new things everyday in their Circle Time. The Circle Time is a chart which has various topics all together in one place. The children can learn about the weather, days of the week, month, words, date, colors, shapes and counting numbers. August is the third month of the 11 month school year. The children are being introduced to new activities and topics in the Montessori and Circle time in their classes. 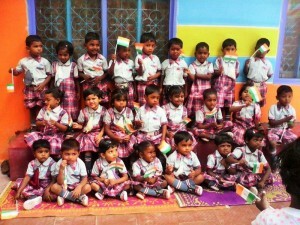 The children were taught about the Indian Independence and celebrated the 66th Independence Day on August 15th. The total enrollment of the school is 96. The average attendance is 93 students per day. Total number of meals served in this month were – 3,316. 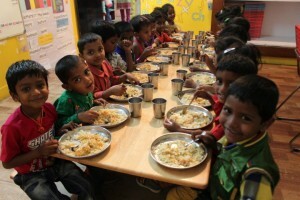 The total number of meals served at Edelweiss since the opening are – 74,469. 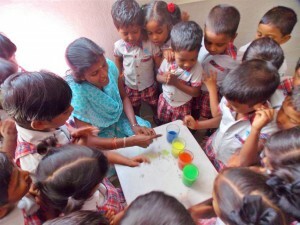 The students of class K4 are being taught cleanliness and hygiene – washing hands and brushing teeth. The kids are also learning about the body parts and the five senses in their Viva Science. The Edelweiss school has a brand new location! 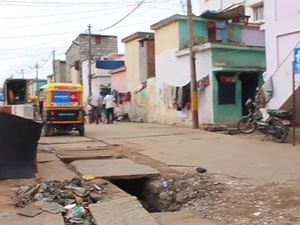 Due to the unfortunate removal of the BTM Layout slum where the school was initially situated, it was decided to relocate the school as the attendance at Edelweiss would eventually have dropped. 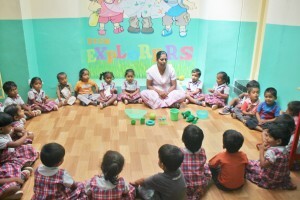 Edelweiss is now located in Tilak Nagar where it will continue to provide its services to bright and eager children. The “Re-launch Ceremony of Edelweiss School” was celebrated on the 8th of July 2013 and was attended by many people, known to the AlphaBet Club and Building Blocks. The ceremony was simple, with the ribbon cutting and the traditional lighting of the lamp. Everyone attending wished us success for the future! April is the 11th month of the school year. The last month of the academic year. Since, April is the last month of the year, before school shuts down for summer vacation; the entire curriculum was reviewed for the final examinations. The students were also taught music with the Brillkids Little Musician. The kids learned fundamental body movements like Walking, Running etc. 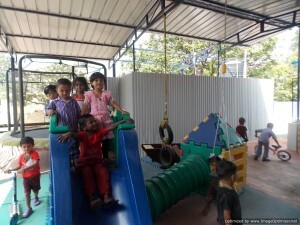 They also enjoy playing in their play area. The character development card for the kids in this month was ‘Being Respectful’. Saturday, March 2, 2013 was an important day! 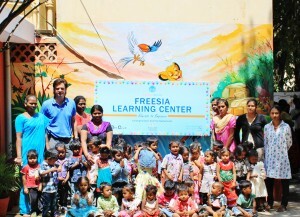 We celebrated the opening of Freesia School in Bangalore India which will educate, free of cost, 100+ children living in the Chinnappa Garden slum. Each student is given educational materials and 2 nutritious meals 6 days a week, including periodic medical check ups, all free of charge. The children are taken on excursions so they can experience restaurants, zoo, shopping centers and parks for the first time. The school will also have a Kitab Korner library so students have access to quality children’s books. Edelweiss was colorful this month, with the celebration of Holi festival and also because of the visitors that came in! The students had a great time at the Edelweiss. March is the 10th month of the school year, 1 month remaining. The K5 kids are reviewing their Tricky words, Sounds, Formation, Blending and Dictation in their Jolly Phonics class. In Genki English class, the children were taught “Where do you live?”, “Where are you from?” etc. The kids also enjoyed learning music through Brillkids Little Musician. February is the 9th month of the school year, 2 months remaining. A good start to the month! We had many visitors who spent the day with the kids, had fun and were happy to see the kids moving forward in their lives at Building Blocks Edelweiss. Many fun and exciting activities were planned for our classrooms. The children learned a lot of new things in their academics. January is the 8th month of the school year, 3 months remaining. A warm welcome to all the kids and staff at Edelweiss and to all those associated with this learning center, best wishes for a healthy, happy and fun-filled 2013! 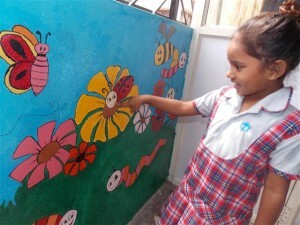 January saw the Edelweiss learning center being painted with vibrant colors and beautiful murals on all the walls. 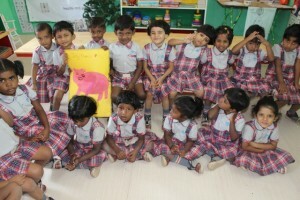 The kids surely enjoy their time here, amongst beautiful paintings in their classrooms. Tricky words, sounds and word formation were reviewed by the K5 kids in their Jolly Phonics class. The kids learned ‘Doctor, Doctor’, ‘How much?’, ‘How many?’ and ‘I’m thirsty’ in the Genki English class. 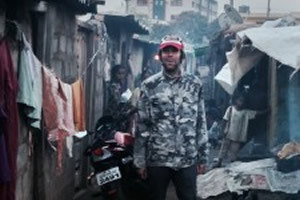 Watch the new video of the building that we are making into our new school and a walk through the adjacent Chinappa Garden slum – where our future students live. 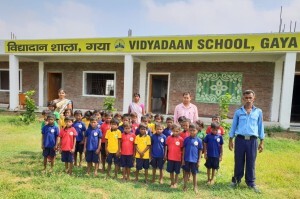 Looking to open new school for 100+ children in February. 2012 was an excellent academic year for Edelweiss, so many things seen and so many things learned. There has been an immense advancement and much has been accomplished on all fronts, by the students and staff at Edelweiss. 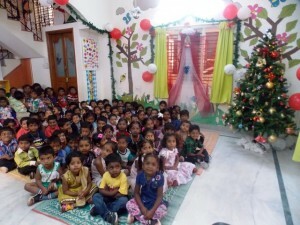 December was a thrilling month for the kids at Edelweiss. They were invited to many Christmas parties. They enjoyed themselves very much. They received many gifts and loads of love was showered on them by everyone they met. December is the 7th month of the school year, 4 months remaining. There was never a dull moment for Carnations in November! It was packed with loads of fun activities like the Diwali celebrations, visitors, special events and a lot of “School” too. 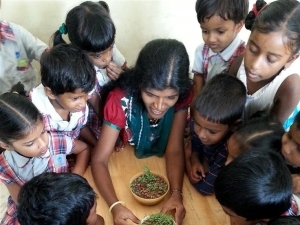 The teachers put their best into keeping the children happy, healthy and growing. In math, the K4 children are learning the concepts of over, beside, down, on, in front of, behind, forward, top, middle, bottom, first–next- last, start & finish and back-to-back through fun activities. The K5 Children are practicing writing 1-50, ordinal numbers 1st-10th, concepts of before after and in- between, counting up to 100 and counting by 2’s, 5’s and 10’s. In phonics, they are practicing reading sentences, recognizing capital letters, identifying short vowels and tricky words in the given sentences. 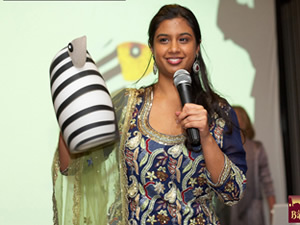 AlphaBet Club’s Biggest Night in 2012 where funds raised with Rotary Club Amsterdam Internatinal fund 1 NEW SCHOOL (Freesia) for 100+ children. (also 1 New School Bus). Special Thanks to Rotary Club Amsterdam International, Wilde Ganzen & all ABC Friends for a Bangalorious Night by attending and donating 60+ items for raffle/auction. 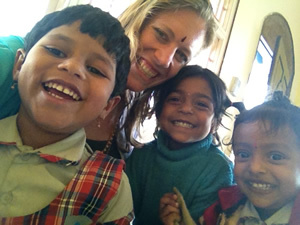 Enjoy this new video highlighting our school & nutrition projects in India. Thanks to Rotary Club & all AlphaBet Club volunteers & friends who made our ‘Bangalorious Night’ Gala Event a great night & raise enough funds to build 1 New School. Enjoy the photos below from our big night. And for info on the impact funds raised this night are having see the information on Freesia School. The children of Building Blocks Edelweiss had a very exciting month. It was filled with colorful activities, special guests visiting, celebrating festivals and some holidays too. Here is the news of what the children are learning at school and the different activities they are doing. After exploring different materials in the previous classes the children are now learning about spatial relationship. They are having fun understanding concepts like left -right, above-under, high-low and inside-outside through activities like stackable snacks, bubble blowing and positional I spy. The children had a lot of fun and educative activities this month. They had Prewriting skills like scissor activities, fun with paper and tracing activities, making a fruit rainbow and paper snipping collage work.The children look forward to these fun activities. This month with a total strength of 97 students. We had an attendance of 95%. At the Senior KG level our children are learning the concepts of numbers 16 -­‐ 19 and phonetics “ai”, “j” through songs and activities. They are also learning the amazing “My World” in science. Moral science: Children are learning “Diligence” through stories and activities. 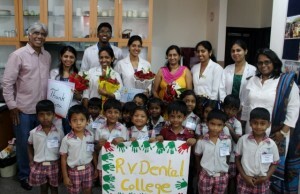 They are also learning to keep clean, brushing teeth and washing hands regularly. July 5, 2012. Today New Record Attendance – 90 children attended School of the 97 enrolled. New School Year started last month & we’re working hard to get 20 more kids out of the slums & into school with 2 meals each day. Thanks again ABC Community, for all of your continued support in our schooling projects! Building Blocks Celebrates Independence Day! 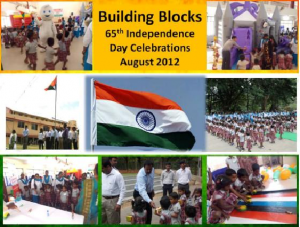 On the 14th of August the children celebrated the 65th Independence day. The event started with the lighting of the lamp by Dr. Kavitha Reddy. Mr. Senthil Kumar, Mr. Alok Mohanty and Mr. Praveen Kumar from the MedPlus company also joined the ceremony. Different game stalls and two huge bouncing castles were set up. The children played at all the stalls and danced to some foot thumping music. It was fun! 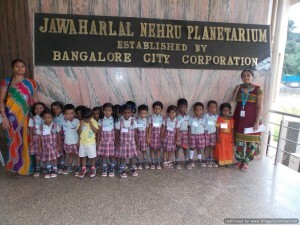 Mr. BNS Reddy IPS hoisted the Indian national flag and the children sang the national anthem. This was followed by a special yummy meal. The children received a gift hamper each sponsored by Johnson & Johnson, Heinz, P & G, Wipro, Colgate, Palmolive, HLL, and Nestle.